The Bruins extended their winning streak to seven games with a 2-1 win over the Lightning, taking sole possession of second place in the East in doing so. 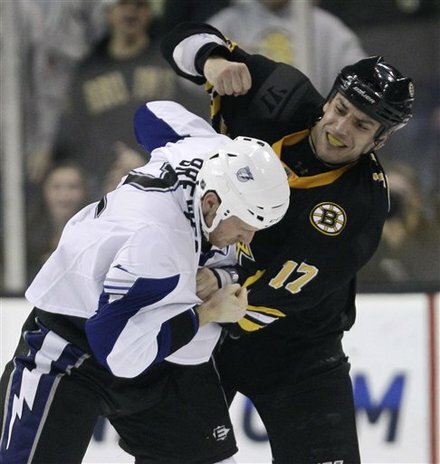 Tim Thomas made 27 saves in net for the victory while Steven Kampfer and Milan Lucic netted the goals for the Bruins. The Bruins penalty-kill also kept the potent Tampa Bay offense off the board despite a lengthy 5-on-3 bid in the second period. Lucic’s goal came with less than four minutes remaining in regulation to ensure the victory, he was also an assist shy of the Gordie Howe Hat Trick. The Bruins had some early chances on a freewheeling Tampa Bay team, the best being a Patrice Bergeron one-timer from in close. Bergeron reached in and fired a shot while falling but Mike Smith went right to left and made a diving glove save to keep the game knotted early on. In fact, Mike Smith was the only thing keeping the Lightning in the game early on, flashing leather often and bailing out his teammates several times. The Bergeron line had golden chances almost every shift in the first half of the period. The Lightning got the games first power-play right after a great bid of their own. Tim Thomas made a great save with his glove hand out front and then Milan Lucic was called for cross checking, giving the potent Tampa Bay offense a chance to earn the games first lead. The Bolts forced Thomas to get out of position a bunch of times and nearly scored a few times, getting pucks behind Thomas. Steven Stamkos hit the post and Thomas got his glove down just in time to freeze the rebound. The Bruins ultimately survived the penalty and then drew the next penalty a few sequences later. The Bruins wouldn’t do much on the power-play, they had good movement but still couldn’t solve Mike Smith. The Bruins would actually have many more chances in the minutes after the power-play, nearly scoring a few times, including a tip that rang pipe and stayed out despite Smith having no clue as to where it was. Milan Lucic would hit Boston’s second pipe of the period with around a minute left in the first, hitting it dead from the slot. This spurred a frantic final minute where the Bruins dominated in the Tampa Bay zone but still came away with nothing. The Lightning would get out on top with a fervent start to the period that resulted in an Eric Brewer goal early in the period. Eric Brewer found the puck on his stick after a rush broke down. Brewer fired it from the center of the blue line and deflected the puck off of Steve Kampfer and in past Thomas. The shot appeared to be going wide but the deflection put it in right inside the post. The Bruins wouldn’t be down long as Kampfer redeemed himself by scoring on his very next shift. The Bruins got down on the forecheck and won the puck back to Kampfer on the right blue line. Kampfer moved towards the center of the zone and fired a nice low shot on net through traffic. Smith couldn’t track the puck through the sticks and feet and Kampfer’s low shot found a home off the post and in the net. Shawn Thornton and Steve Downie would get 10-minute misconducts after Gregory Campbell went crashing into the Tampa net for what must have been unsportsmanlike conduct as nothing major physically happened. Interestingly enough, Mark Recchi would be pushed into the Tampa Bay goal on the next shift when Marty St. Louis stuck out a skate and pushed him into the net with his backside. Things continued to be chippy in the second period when Mattias Ohlund crosschecked David Krejci in the face. The Bruins power-play didn’t look great and ended with a big scrum that turned into a fight between Lucic and Brewer. Nathan Horton started the scrum when he took a run at Dominic Moore, who had wronged him in a previous shift. The Bruins goonish activities resulted in a Tampa Bay two-man advantage for nearly a full two minutes. After a fruitless first minute of the 5-on-3, the Lightning took their timeout, sensing how big the power-play was. The Bruins killed off the two-man advantage with a few clears and great positional defense. Upon the release of Horton and Michael Ryder the Bruins nearly went ahead when Ryder sprung Horton for a sneakaway but Smith blocked Horton’s wrist shot down inside the slot, singlehandedly stemming a huge momentum shift. Dennis Seidenberg would get two minutes for crosschecking Sean Bergenheim in the face, giving the Lightning a late chance to take a lead to the final period. The Bruins penalty-kill would bail out the team once again with yet another impressive kill, keeping the game at 1-1. Brad Marchand was robbed by the glove of Mike Smith, who’s glove hand had kept the Bolts in the game up to that point. Bergeron jumped on a loose puck and feathered a saucer pass to Marchand in space in the slot but Smith kept it out. Tomas Kaberle would nearly score when he took a full-length rush all the way down and hit the outside of the post on a nice wrist shot from in close. Soon after with all the momentum going the Bruins way Tampa would take a penalty, giving the Bruins a chance to take a lead in the final 10 minutes of the game. The third Bruins power-play would go by the way side but the Bruins momentum would continue to build after the penalty expired. Milan Lucic would give the Bruins the go-ahead goal when he threw a loose puck over a mountain of downed players in the crease from a sharp angle. The play looked to be over when there was a scrum in the crease for a loose puck. The puck was never covered up and the play continued, eventually the puck kicked out towards the goal line. Milan Lucic got to the puck, took a look at the net and fired a shot over the downed Smith and into the net. The Bolts pulled their goalie with a minute left but the Bruins stayed tight and killed off the final minute with a lot of confidence to extend their winning streak to seven games and take full control of second place in the East. The Bruins will next play the Penguins on Saturday night.